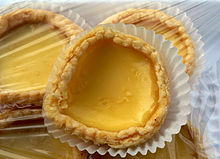 This is a list of custard desserts, comprising prepared desserts that use custard as a primary ingredient. 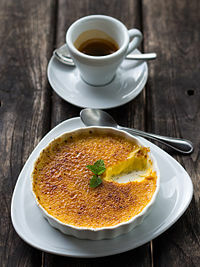 Custard is a variety of culinary preparations based on a cooked mixture of milk or cream and egg or egg yolk. Some éclairs have a custard filling. 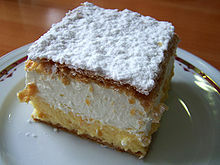 Galaktoboureko is a dessert of semolina custard in phyllo dough. Look up custard in Wiktionary, the free dictionary. ^ a b Davidson, A.; Jaine, T.; Davidson, J.; Saberi, H. (2014). The Oxford Companion to Food. Oxford Companions. OUP Oxford. p. 241. ISBN 978-0-19-104072-6. Retrieved February 6, 2015.